When it comes to entertaining friends, however, you might feel compelled to spice up your drink selection. But don’t break out the gin and bitters just yet – all you need is abeer and a few easy ingredients. This classic beer on beer combo has been a favorite in British pubs for a long time (like over 100 years). 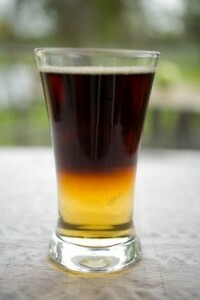 The drink layers a stout or porter on top of a light lager/ale. Commonly, your beertender will make it with a Bass Lager base, finished with Guiness Draught. When pouring the Guiness, it is important you use the proper equipment to avoid premature combination of the layers. Lay an upside-down spoon across the top of the pint glass, and pour the beer over the rounded spoon. You want the beers to mix in your belly, not the glass.